• Maintaining Tomato Health After Harvest - Jerry A. Bartz, University of Florida, October 2016. • Tomato Fertility - Soil vs Soilless - Emmanuel A. Torres-Quezada, Freedom Ag Research, June 2016. • Processing Tomato Production: Seed Sector and Propagation in California - Gene Miyao, University of California, March 2016. • Recent Viroid Disease Outbreaks in Greenhouse Tomatoes in North and Central America and Their Management - Kai-Shu Ling, USDA-ARS, September 2015. 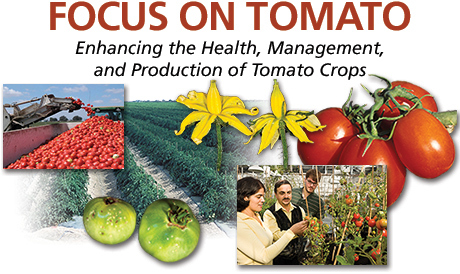 • Weed Control Considerations for Organic Tomato Production - Doug Doohan, The Ohio State University, April 2015. Please include the word "tomato" in your search.